The next time you text a photo to a friend, download a massive data file, or use your car’s self-parking feature, give a nod to Larry Dalton, UW professor emeritus of chemistry. Materials developed by Dalton have radically increased the sensitivity and speed at which information is processed, with applications from medicine to telecommunications to autonomous vehicles. No wonder Dalton has amassed nearly two dozen awards and is an elected fellow in five major science and engineering societies. Dalton still manages two large grants for his UW lab, serves on numerous advisory committees and working groups, and encourages budding scientists through visits to K-12 schools and colleges with large minority populations. 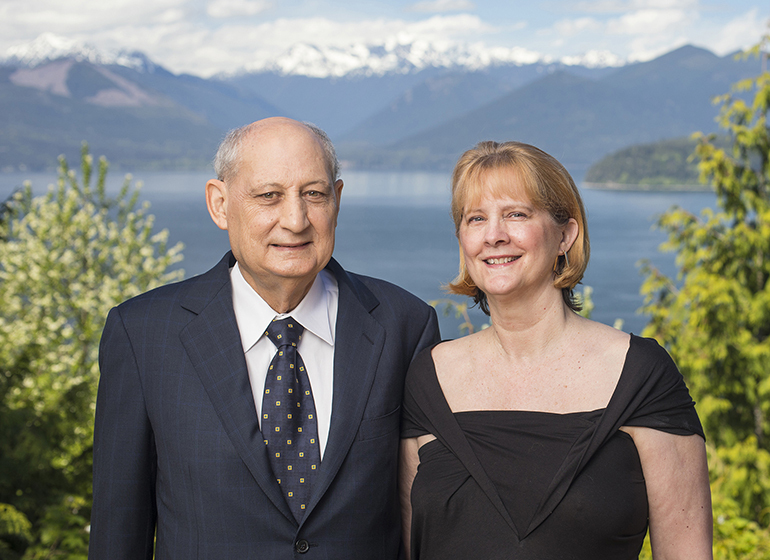 It was thinking about future generations that led Dalton and his wife, Dr. Nicole Boand, to recently commit $12 million to the Department of Chemistry for faculty and postdoctoral support—the latest chapter in the couple’s long history of giving. Their previous gifts to the Chemistry Department include two endowed professorships, two endowed chairs, and support for graduate student fellowships and undergraduate assistantships. Kwiram and Dalton have remained close friends and colleagues, both eventually joining the UW faculty. Dalton and collaborators made dramatic advances in optoelectronics, which high-tech manufacturer Lumera (now part of GigPeak) then licensed. The pioneering research also led to the establishment of the Center for Materials and Devices for Information Technology Research at the UW, funded through a ten year, $40 million National Science Foundation grant. The gift will also fund Dalton Postdoctoral Fellowships in Chemistry. While most postdoctoral students are supported through faculty grants and therefore work for individual faculty, Dalton Fellows will have the freedom to pursue their own research. The majority of Dalton and Boand’s $12 million gift will be dedicated to these postdoctoral fellowships, funding several fellows each year. Michael Heinekey, chair of the Department of Chemistry, is excited by the fellowship’s potential to attract top early-career chemists. “Only a handful of postdoctoral fellowships of this type are offered by U.S. chemistry departments, so they are highly coveted,” he says. “This will be huge for the department.” It’s a bold gift, made possible by a couple used to thinking big. You can support the next generation of scientists and empower vital discoveries through a gift to the Chemistry Department. You can support Arts & Sciences faculty, empowering their work to elevate human knowledge, develop solutions to pressing problems, and drive innovation.